This Apple MacBook C2D 2.1GHz 13″. It is in working condition it has some cracks around the case. The machine has been fully tested and refurbished by Affordable Mac These are in Grade C condition not great. It comes with a Affordable Mac MagSafe Charger. They have also had a new battery installed. Because of the new battery there is a slight colour difference on the bottom of the laptop as the battery is a fresher white than the more used case of the actual laptop. Quietly unveiled without a press release — just like the model it replaced — the Apple MacBook “Core 2 Duo” 2.13 13-Inch (White – Mid-2009) features a 45 nm “Penryn” 2.13 GHz Intel “Core 2 Duo” processor (P7450), with two independent processor “cores” on a single silicon chip, a 3 MB shared “on chip” level 2 cache, a 1066 MHz frontside bus, 2 GB of 800 MHz DDR2 SDRAM (PC2-6400) installed in pairs (two 1 GB modules), a 160 GB Serial ATA (5400 RPM) hard drive, an 8X DL “SuperDrive”, a NVIDIA GeForce 9400M “graphics processor with 256 MB of SDRAM shared with main memory”, and a 13.3″ widescreen TFT active-matrix “glossy” display (1280×800 native resolution). 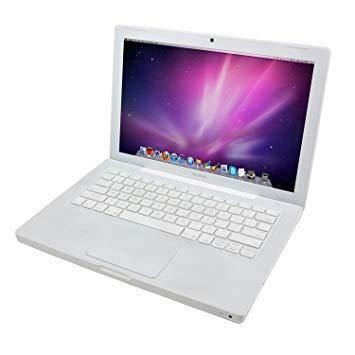 The MacBook “Core 2 Duo” 2.13 13″ (White – Mid-2009) shares the same white polycarbonate case as the MacBook “Core 2 Duo” 2.0 13″ (White – Early 2009) that it replaced and connectivity is the same as well with AirPort Extreme (802.11a/b/g/n), Gigabit Ethernet, a FireWire “400” port, two USB 2.0 ports, optical digital audio in/out, and video out capabilities (mini-DVI) that supports an external display. The hard drive is larger and the memory is faster. Interestingly, Apple also officially claims that this model provides 5 hours of battery life (up from 4.5 hours on the model replaced). Internally, this system has quite a bit in common with the MacBook “Core 2 Duo” 2.0 13″ (Unibody) and is equipped with the same NVIDIA GeForce 9400M graphics, but uses a faster processor and slower RAM (800 MHz DDR2 compared to 1066 MHz DDR3 in the “Unibody” models).